There is a certain satisfaction to picking Highbush cranberries yourself, not only because they are free-appealing to the cheapskate within- but also that my kids got to help me pick and then eat their just rewards. Those little turkeys were right in the bushes with me, “helping” to pick these and said little turkeys have been enjoying this jelly in their sandwiches and on toast. It really isn’t just for turkey at Thanksgiving, it has that definite taste of cranberry jelly, but is miles away from the commercial stuff. I am going to have to git out there and pick more berries, because the jelly is a daily demand on toast now. I am going to run out before a single major holiday rolls around! Take your eight cups of cranberries and squish them. Which is actually popping them. Son of a gun, I looked like I was blood splattered after this part of the recipe, it looked like something out of a horror movie. The berries do not squish nicely, they explode. What I finally did was take a cup and use the bottom to mash them, not only did it help keep the bloody cranberry gore splatters from flying everywhere, it popped them better. Add the water into the pot and boil the berries for 10-15 minutes. This part is stinky, they don’t emit a very pleasant odor when boiled. Or at all actually, when we picked them I actually “smelled” the berries first, so I started looking for them while we walked. It sounds rather Les Stroud of me, but in the fall when you are walking in the bush and smell something that is worse than your gym shoes? That’s fall ripened cranberries. Once they are done boiling, strain them through a cheesecloth. I put the cheesecloth over a colander, then over a pot, works beautifully. You will get a good 5 cups of juice, and to this add your sugar. Time to boil it up! 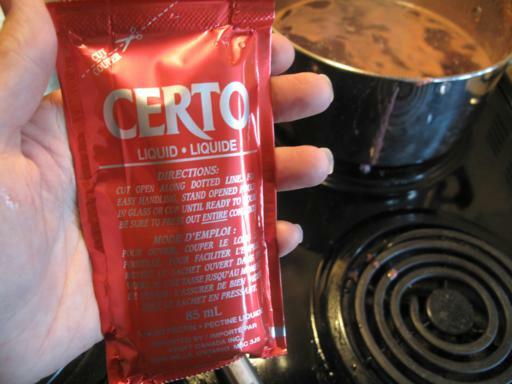 Once it’s boiling, stir in the liquid certo. Bring it back to a full boil, then boil it hard for a minute or two, making sure to stir constantly. There will be foam on top, so skim it off. I have found that if you let it sit for a couple minutes, the foam forms a skin on top, making it really easy to scoop it all off cleanly. You do want to try and get it all off, when making a jelly it’s so crystal clear that foam bits show up as “floaties” in the middle of the jar. Pour into your sterilized jars, leaving about 1/4 inch left at the top. Make sure that before you put the lids on, wipe the rims as clean as possible, because this is is number one reason they won’t seal when you put them in the canning pot and boil them. These needed to be boiled in the canning pot for 10-15 minutes. I did a lot of small 125 ml jars to give away with my Christmas baking this year, little tastes for everyone. Not everyone likes cranberry jelly-though I now dare them to try this instead, what a difference- and the 125ml is a perfect size for one meal with a few people who like it on their poultry. Now, I need to get out to the River Valley and find some more cranberries to pick, so the kids can have some! I hid my little Christmas jars on them and they keep asking for jelly, mean mother that I am. 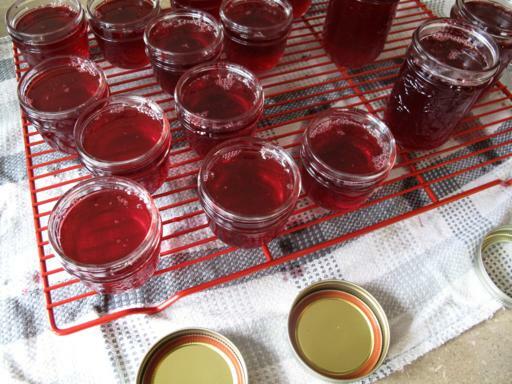 Homemade jelly made from the abundant Highbush cranberry! Take your eight cups of cranberries and squish them. Which is actually popping them. Son of a gun, I looked like I was blood splattered after this part of the recipe, it looked like something out of a horror movie. The berries do not squish nicely, they explode. What I finally did was take a cup and use the bottom to mash them, not only did it help keep the bloody cranberry gore splatters from flying everywhere, it popped them better. Add the water into the pot and boil the berries for 10-15 minutes. This part is stinky, they don't emit a very pleasant odor when boiled. Or at all actually. When we picked them I actually smelled the berries first, so I started looking for them while we walked. It sounds rather Les Stroud of me, but in the fall when you are walking in the bush and smell something that is worse than your gym shoes? That's fall ripened cranberries. Once they are done boiling, strain them through a cheesecloth. I put the cheesecloth over a colander, then over a pot, works beautifully. Once it cools enough, you can lift it up and squeeze the remainder out of the cheesecloth. You will get a good 5 cups of juice, and to this add your sugar. Time to boil it up! Once it's boiling, stir in the liquid certo. Bring it back to a full boil, then boil it hard for a minute or two, making sure to stir constantly.There will be foam on top, so skim it off. I have found that if you let it sit for a couple minutes, the foam forms a skin on top, making it really easy to scoop it all off cleanly. You do want to try and get it all off, when making a jelly it's so crystal clear that foam bits show up as floaties in the middle of the jar. Pour into your sterilized jars, leaving about 1/4 inch left at the top. Make sure that before you put the lids on, wipe the rims as clean as possible, because this is is the number one reason they won't seal when you put them in the canning pot and boil them. These needed to be boiled in the canning pot for 10-15 minutes. I enjoy your enthusiasm. I also enjoy all the comments. Everyone helps to answer the questions in my head and I relate to so many people’s experiences. I used 5 cups of juice – squeezed the bag, 7 cups of sugar and one package of powdered Certo. It turned out great! I think I am going to try this,but my family likes more jam like spread. What do you think about leaving most of the skins? I have problem with getting mine to jell as well. I am assuming that you gave yours the water bath as well, My mother never water bathed hers after and she never used anything but Certo. I followed the recipe exactly but I didn’t water bath either. I found 2 different recipes online, made 2 different batches, both are like syrup. Next time it will be powdered sure-jell. Using both recipeis of course. Maybe a water bath too. i’LL THINK ABOUT IT…..
this jelly is absolutely amazing on tea biscuits!! 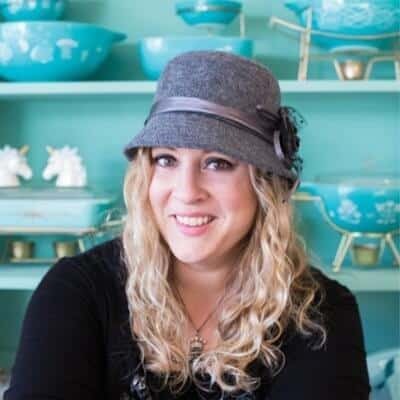 Hi there – love the sound of this recipe! 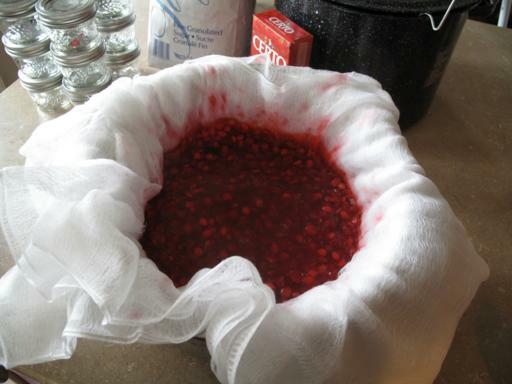 Can I uses the pulp in the cheesecloth to make a thicker cranberry sauce (like I do with quince paste) or has the flavour all dripped into the juice? any thoughts on using the non-Certo version path to a shrub? I’ve recently made plum-peach shrub and found it to be a great alternative to many other beverages. looked today (in NEK of Vermont) for cranberries and found zip. I made a great amount of crab apple jelly, some of which will be used as underlay(or overlay) for pies and tarts. My plums, crab apples and berries passed by so quickly in this weird weather pattern. Now I want to see if cranberry and apple can make a shrub? My crabapples had enough pectin to suport a pencil and I vinegared a jar to see what I might find. Worked well. The jelly turned to shrub (increase of about 1/4 to 1/3 of total). I’ve been picking up apples from the many old trees along the roads and testing for taste, critters and pectin. So many apples and no cider press (yet). I bought a jar of non-high fructose apeach-apricot preserve today to see what might be wrought. Just did this recipe ad when they jars cam out of the hot water bath the jelly was more loose then when going in the canner. Will it set up? No Certo option: If you use cranberries that are partially ripe (red/yellow – make sure they’re at least partly red), you will still get a red jelly, with the bonus of not having to use any Certo – so much natural pectin in the less ripe fruit. I used the same amount of sugar (1 1/2 c. sugar to 1 c. cranberry syrup) and it jells like crazy. 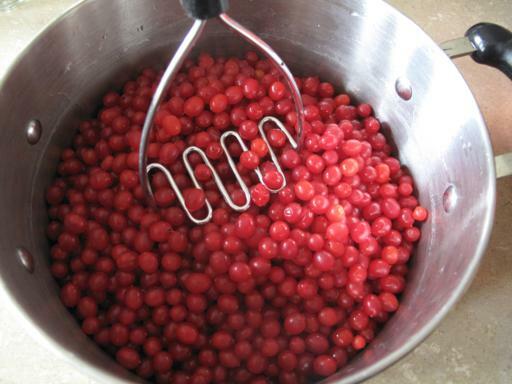 I just clean the berries, cover with water and boil, crushing with the potato masher as they cook (you won’t get splattered this way). 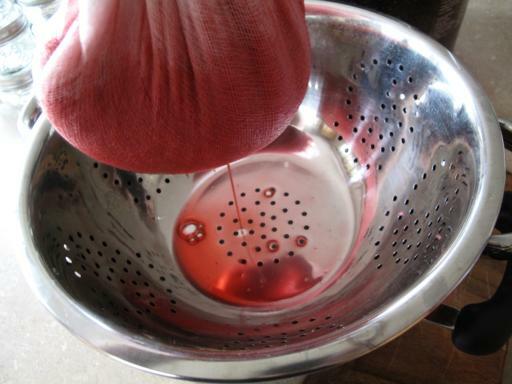 Then pour the cooked mixture into the jelly bag to drip (I never squeeze it – old school). Then reheat and add the sugar until the wooden spoon gets two drips instead of one. This is the way my mom made it and it works for me every time. (and supposedly never make jelly on a cloudy day – something to do with atmospheric pressure and it won’t gel). thanks. I had saved five cups of juice but darned if I could find the recipe in the three books I have. Don’t know what recipe I used but this will do. I haven’t tried using powder before, in this recipe. I have been unsuccessful in using items other than called for in the reciepe. However, if you don’t mind having syrup if it doesn’t set….go for it! Syrup is great on pancakes, waffles, crepes, and the like! Can we substitute Sure Jell powder for the liquid pectin? Easier to squish the berries while they first boil, no need for the first step. i have made this recipie for 60 years, never fails, we use it on everything, not just chicken, of course i only have to walk with my bucket and cutters for 2 1/2 minutes to my laden bushes, then i pick, sort and save enough to freeze for other wonderful recipes during the winter, also give some to my sister to cook with, easy as pie, i even win at the local fair with my jelly, try it, you’ll love it. Not until way later on in the fall! They have to be very red and juicy first! When do I pick these little beauties. My husband and I planted about 20 of them several years ago. We have sooo many this year and I am finally “ready” to make this jelly. However, I have no idea when they are ready? I just made this! Its turning out great! Added a little orange juice because my cranberries didn’t yield 5 cups (because I didn’t have 8 cups, haha) of juice. Liistened to another review and added a bit of cloves before the mesh straining part . then cinnamon, nutmeg to the main batch. I did add two pouches of certo (because this is only my 2nd time attempting jam and I was nervous it wouldn’t set! It was so liquidy after only one pouch, is that normal?). Anyways, Thanks so much for the recipe! It TASTES AMAZING!! Thank you so much for the kind words! I am so glad that it turned out, aren’t they delicious berries?! I live in Kenai Alaska and have a yard full of highbush cranberries. I’ve never done anything with them before this year when I decided they were just too beautiful to pass up. I found your recipe and tried it today…..WOW! Amazing! I’m headed out to the neighbors to see if I can pick theirs. Thank you so much for sharing this, my family loves it! There’s natural pectin that you get from the real berries that juice just does not have after all the processing it goes through. The pectin is released from the skin etc while boiling it. Thanks for the recipe… So far so good, I minced and tossed in a couple Habaneros plus a handful of cloves in the first boiling step..(pre-cheesecloth). I think it came out pretty tasty. 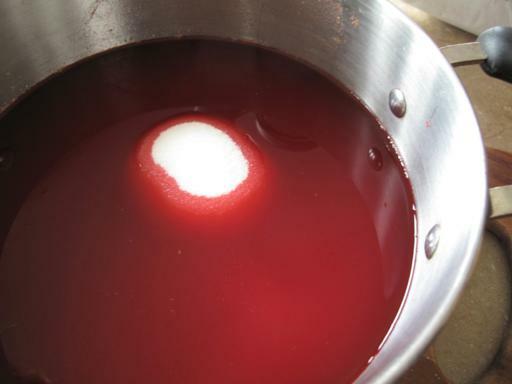 I’ve made some runny Jams before but no Jellies… so I was a bit worried it wouldn’t jelly up.. But It looks like it did! I just make homemade cranberry juice whenever we have it in our home and you gave me a good idea. 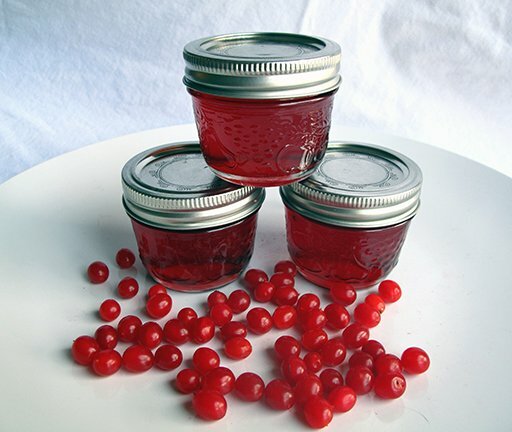 I can now make cranberry jelly, thanks for the great recipe. You saved my ……….jelly!!!!! Last weekend my Husband and I picked 2 buckets of HB cranberries at our Friend’s place in the country in central Alberta. I cleaned them and washed them ……it took all day and then went to the net for a recipe. 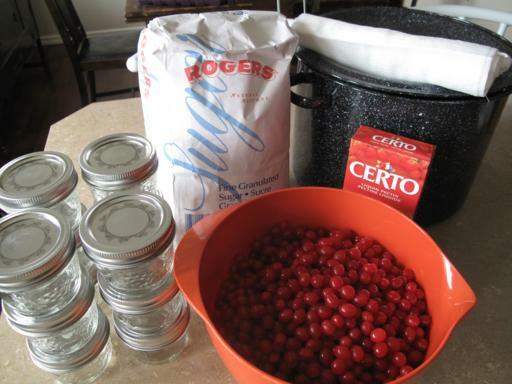 I used a Certo recipe for cranberry jelly……I have been making jams and jellies for many years……..and the jelly did not set……..all 25 jars!,,,,Soooooooo I went to my iPad and there you were with a recipe for HB cranberry jelly!!!!!! I remade the jelly with an adapted version of The Magpie’s and super success!!!!!!!! Thanks so much!! Well that’s just fabulous to hear! Glad you saved it, nothing is worse than jelly not setting properly! I love the stuff, SO much better than the usual cranberry jelly, it has a taste all of it’s own. Can you substitute the powdered pectin for the liquid to make the jelly set? Or perhaps natural apple juice with the cranberry juice? @Judith I have similar issue with this jelly last night…I went to check and it hasnt jelled…it did thicken but more like syrup…I used 4 1/2 cups of hb cranberry juice, 4 cups of white sugar, 3 tbsps of lemon and 1 pouch of liquid certo…I did pretty much exactly what the recipe asked me to do….since you were able to save your jelly..I’d like to save mine too…any tips? Thanks! @Judith – how did you adapt the recipe? My dad and I made this jelly last night and it did not set. Can we reboil? Add more pectin? Add more sugar? Sure don’t want all those berries and work to go to waste. 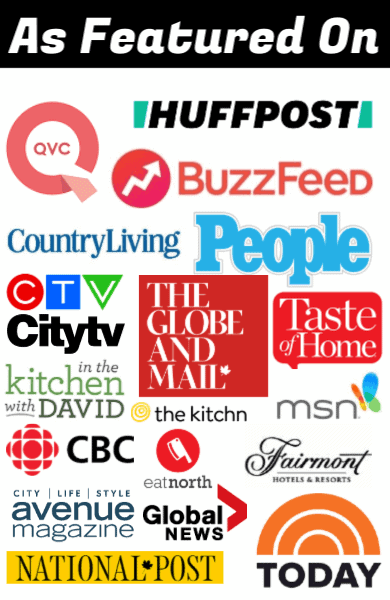 Where can I buy some jelly here in B.C.? Does anybody from Alberta make and mail it??? Oooh, envy is bad, but what can I do. I picked a bunch of low-bush cranberry for the first time out by Lac La Biche this weekend. Talk about tiny yield compared to high-bush. I’m really, really, REALLY glad to see another local blogger writing about these!! !